The people have spoken! 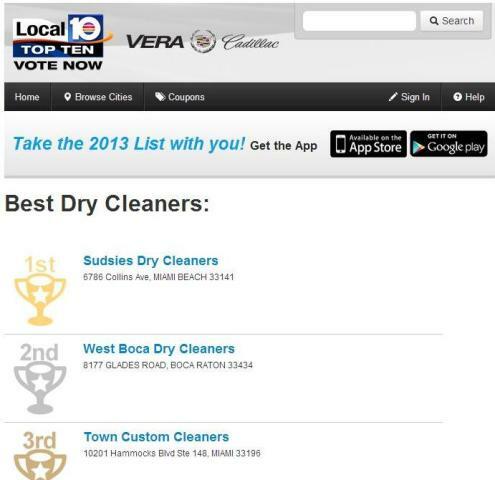 Sudsies Dry Cleaners & Laundry is officially South Florida’s most beloved dry cleaner as the category winner in the 2013 WPLG Local 10 Top 10. The television station granted the company the top ranking following a dynamic voting campaign conducted through the station’s website and social media outlets. Sudsies offers a full range of clothing and specialty item services across Miami-Dade and Broward counties, including complimentary pick-up and delivery to its clientele’s location of choice. Founded in 1996, Sudsies has been a pioneer in the industry, becoming South Florida’s first fully-mobile dry cleaner. The company has expanded its services over the years to meet every customer need including environmentally-friendly dry cleaning, laundry, alterations, restoration and preservation, as well as care of couture garments, wedding gowns and other specialty items. Most recently, Sudsies opened a second processing facility in North Miami and enhanced its customer convenience even further by offering Sudsies Express Mail services across the United States. High-tech facilities, in-depth skills and expertise, and customer convenience are part of the Sudsies S.M.I.L.E. mantra to provide friendly, impacting experiences for its clients. Both locations incorporate EPA-sanctioned green cleaning initiatives including wet cleaning processes, gentle detergents, water-conserving machinery and recyclable hangers and packaging. More information about Sudsies and its many offerings can be found at www.sudsies.com or by phoning 1.888.898.SUDS (7837).